Susan and Ben Carn invite you to enjoy the most picturesque part of their working sheep property. Stay in the self-contained Wilderness Cabin and drive the exciting Horseshoe Rim 4WD Track. Our property is located 320kms north of Adelaide in one of the many ranges which make up the Flinders Ranges – the Horseshoe Range, which is between Quorn and Carrieton. The “Wilderness Cabin” offers privacy (only one cabin) and comfort amid spectacular scenery. It is nestled amongst rugged hills and overlooks a huge dam. The self-contained cabin can comfortably sleep up to 8 people in two bedrooms: one with a queen size bed, the other with a double bed and two sets of bunks. The open plan lounge, dining and kitchen area is comfortably furnished, with the kitchen fully equipped. The cabin has solar powered lighting, gas appliances and a very efficient slow combustion heater with cut firewood supplied. Outside is a gas BBQ and campfire area. 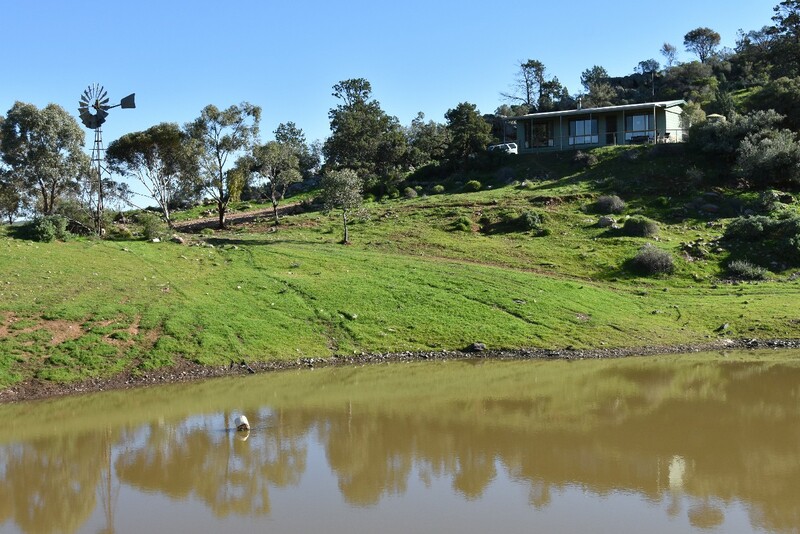 Wake to the sounds of birds and have a coffee watching the sheep and native animals come to drink from the dam below. A fifteen minute walk following the creek will lead you to a sheer rock cliff which with rain becomes a waterfall. Experienced four wheel drivers can drive the Horseshoe Rim 4WD Adventure Track through rugged bushland and stop for photos on hilltops with amazing Flinders Ranges views. You can drive or walk the track and sign your name in the visitors book on the highest peak in the Horseshoe, Mt Stokes. At sunset relax on the verandah, drink in hand, watching the colours change on the surrounding hills. At night, light the campfire, marvel at the stars and enjoy the solitude.